There are several different thoughts on this. If you are the type of person that buys wines on a bottle per bottle basis, a wine cellar is not an investment for you. But if you buy wines and expect those great bottles of wine to be drinkable, while storing them around your home for longer periods of time, you might be a candidate for at least a wine chiller. 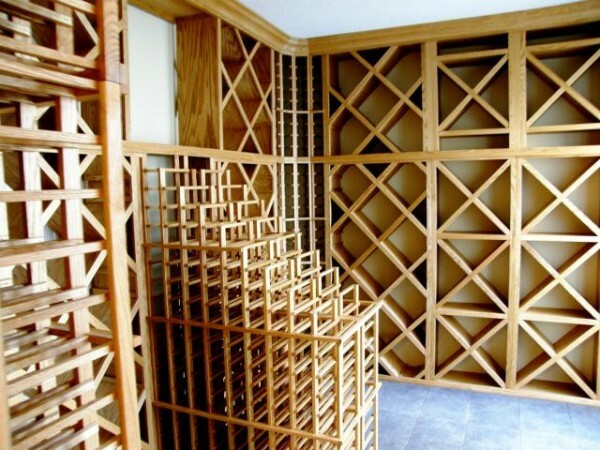 Should you build an elaborate wine cellar? It depends on your needs and purchasing habits. A lot of people think that a bottle of wine can be kept in kitchen cabinets and wouldn’t think anything of it. The temperature in a home tends to be around 70 degrees, give or take a degree or two. Temperatures that fluctuate more than 6-7 degrees could affect that great bottle of wine. For instance, the cork could expand and contract, letting air in and oxidizing the wine. Leave a bottle of wine in a room with a temperature of over 72 degrees and you could certainly, over the long run, have a bottle of vinegar. So if you intend to keep wines for more than six months, you should look into some kind of long-term storage. Having a place to build a wine cellar is another question you should ask yourself. Do you have a place where vibrations and noise could be at a minimum? Can you insulate and vapor barrier all sides of your new wine cellar? Can you vent your cellar into an area that would accommodate the air exchange? The other thing to keep in mind is whether you will be drinking the wine you just bought within the next few months. Keeping it in cooler environment for a short period of time won’t hurt your wines. Do you think the wines in the local wine shop are kept in a wine cellar all the time? The shops move wines pretty quick and do not need, for the most part, a climate controlled wine cellar. But if you are going to buy some age-worthy wines, my advice to you is definitely invest in some sort of proper storage – whether it’s simply a wine chiller or going all out and building a climate-controlled wine cellar. If you are thinking about the latter, make sure that the person who will build your wine cellar is an expert on climate-controlled rooms. Some of my customers have had a wine cellar built that was certainly not big enough. If you think you only need a 700-bottle wine cellar, double the numbers, even triple them. When you have a wine cellar, it always seems that some of your friends are bringing back wines, when they take those trips to the wineries. When having a wine cellar, you are also able to purchase a case or two instead of just a bottle. If you build a wine cellar that is too small, you could soon be back to the original question of what to do with all this wine. • Do I drink my wines as fast as I buy them? • Do I buy any age-worthy wines? • Do I have the space to build a wine cellar? • Do I want to make the investment in a wine cellar? When you do make that decision to build a beautiful wine cellar, do your homework and make sure that your builder is qualified. Know where your racking is coming from. Lastly, when choosing a cooling unit, don’t let the price decide that for you. The cooling unit is a very important part of a wine cellar. John Seitz is a master wine cellar builder for The Magnum Company, a cellar specialist based in Saint-Louis, Missouri. He has been building cellars across the country for over 15 years, in both private homes and restaurants. This is a well written article and I wanted to add the idea of Off-Site Wine Storage. If you don’t have the room or cash for an In-Home Wine cellar Sentry Wine Vault in San Diego can store your wines by the case for a reasonable price in our secure temperature and hunidity controlled vault. I have a wine rack that hold 36 bottles and I have it placed in a dark cool place in my 225 year old log cabin. I buy a case every month and I have kept expensive rare wines for over three years and never had a problem. This to me is the way to go for thoes who want to collect in a small way and learn about wine. We said, “if you are going to buy some age-worthy wines”, I think I would add that for many people two additional considerations are shear love of collecting and entertaining. As a semi-professional entertainer and I apologize if I’m being shallow here but there’s little that impresses your guest more that a good collection in a well designed dedicated wine room!